If you told me 10 years ago that there would be multiple competitive reality TV programs just focused on drag queens, I would not believe you. RuPaul's Drag Race was a new show on a tiny extended cable network edited to hell and back with a filter so blurry you could not understand judges' critiques on design-based challenges. It was awesome, a brilliant balance between reality TV satire and a celebration of incredibly talented performers, but it was a surprise when a second season was announced, let alone the filming of a fourth All Stars season this summer. Now, in 2018, we have TV stations across the world airing drag competitions. The United States of America has the Emmy Award-winning series RuPaul's Drag Race. Thailand finished their first season of Drag Race Thailand, borrowing ideas from the original program but really allowing the contestants to turn the runway into full on night club performances every week. The Switch aired its second season in Chile, featuring contestants who perform in drag and are required to sing live for a packed audience if they are up for elimination. The Boulet Brothers' Dragula: Search for the Next Drag Supermonster is a phenomenal competition series dedicated to alternative drag queens with elimination challenges designed to test the physical and mental limits of contestants (like getting a tattoo, standing in a tub of ice, or being buried alive). The Camp Wannakiki title card, featuring the logo and tagline "Summer camp is a drag!" over the beautiful campgrounds. There have been web-based drag reality competitions before Camp Wanwakiki. Even Dragula started out that way before getting picked up by OutTV in Canada. Camp Wanwakiki is noteworthy in an ever-growing pool of drag reality TV for its perspective, gimmick, and heart. Camp Wawnakiki is a small show, but an ambitious one. 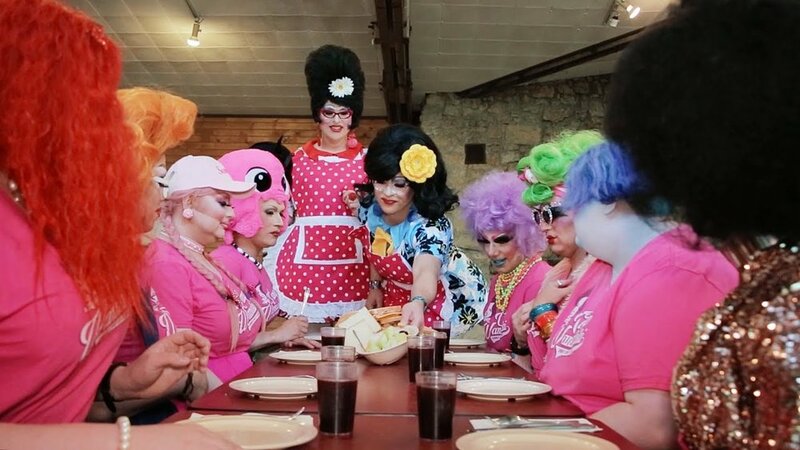 Eight camp queens from the Midwest compete in summer camp-themed challenges at an actual campground in full drag during the day. That alone is brave. Sunlight is no one's friend on film, especially if you're wearing layers of highly transformative makeup designed to trick the eye into seeing a very different facial structure than the one you actually have. Add in the layers of padding, corsets, and wigs and you have some of the most resilient reality show contestants ever. They have to do a lot more on Camp Wannakiki than walk on a runway and stand in a climate-controlled studio. In the two episodes so far, the contestants have had a canoe race, shot bows and arrows, swam in a lake, and did an outdoor photo shoot in full drag. We only ever seen these camp queens in full drag until their elimination. These mini challenges and day-to-day life segments are part of the judgement process, but only to see who is actively embracing the camp (both meanings) experience. There's a daily talent show, where contestants are given a theme for their outfits and are told to perform. The second episode featured a lipsync to a song by Ginger Minj (a RuPaul's Drag Race alumna and fantastic singing actor), while the first episode was pure runway presentation. Contestants who survive each week are awarded their merit badges in punny areas such as "Water Sports" or "Straight Shooter." The reason why I waited for two episodes to air before reviewing this is very simple. The first episode (sorry to spoil it) ends with no elimination. Dear Ruthie, one of the judges, finds an extra merit badge in her purse so she and the Sugarbaker Twins--Apple Brown Betty and Cherry Pi--do not have to send anyone home. It did feel like a genuine decision, especially compared to how often other reality TV shows would choose not to eliminate anyone just to save a clear front runner or a good personality. All the contestants did very well in the first day of competition and the judges were looking at things like wardrobe malfunctions to pick a bottom two. I wasn't exaggerating when I said the contestants are in full drag doing actual summer camp activities like a canoe race. I had to know how the show was going to run before reviewing it. Would there always be an extra merit badge lying around? Were all the contestants going to be kept through the finale as a way to differentiate Camp Wannakiki from the other drag reality shows? Spoiler alert: Nope. That is not the case. One contestant, sadly, did not earn their Straight Shooter badge and was sent home episode two. The judges even asked about an extra badge before the elimination and confirmed that another save was not coming. The reason I suspected that there weren't really going to be eliminations on Camp Wannakiki is a strong compliment to the show. This is just a kind, sweet, and positive program. The contestants on any first season of a reality show, let alone a drag competition, are taking a huge risk. If the show fails, they might wind up with nothing even if they win. If the show succeeds and you're the first one eliminated, you can face bullying and online hatred (just ask the Drag Race contestants). I don't think that will happen in any major way with this show. These contestants, even when they fail miserably at a challenge, are treated with respect and boosted up. In the second episode, one contestant literally falls on their face. No one makes a big deal out of it. There's no slow-motion montage of them falling and no bitter talking head interviews from other contestants mocking them for falling. They are even selected to be the first participant in the archery challenge with a matter of fact observation about the fall with a positive spin. The contestants then cheer each other on the entire challenge whether they hit the target or not. They are all praised for participating and having fun with it. I've only seen the first two episodes, but Camp Wannakiki did pull out all the stops for the first eliminated contestant. Madison, Wisconsin's own Drag Race alumna Jaymes Mansfield recorded a video message for them. Jaymes praised the contestant for doing their best, reminded them of her own journey (she was first eliminated on Drag Race Season 9, but now has a thriving YouTube channel and got to perform her own original show in Provincetown, Massachusetts--the go-to summer destination for original drag performances in the United States), and encouraged them to continue drag and make the most of their time on the show. Forget about a contestant from the biggest drag reality show complimenting the first eliminated contestant. Jaymes is local to these queens. She's probably worked with most of them. She knows them. This is a comforting message from a friend and ally who knows where they came from and experienced the reality TV machine already. These aren't empty words of praise from random celebrities; this is someone they know reaching out to acknowledge everything they're capable of. See what I mean about the unbridled positivity? It's wonderful. The Sugarbaker Twins serve up lunch to the contestants in the second episode of Camp Wannakiki. The entire production is a joy. The judging team is engaged in the challenges like very few hosts I've seen before. We're talking Jeff Probst following along the obstacle course on Survivor involved. In the canoe race, Dear Ruthie stood on a dock in the lake acting as the buoy the contestants had to paddle around. After the challenge, all three judges got in the water with the contestants to have some fun. More importantly, they are not stone-faced at the judging table. They're being good, positive audience members, but there are genuine moments with laughter, confusion, or even holding up props to protect themselves from a contestant swinging a stuffed prop on a rope. Their critiques are direct but not cruel, and the praise is clearly sincere. Camp Wannakiki is a celebration of camp drag. There really is no other wide venue (reality TV or otherwise) for this kind of drag. Camp drag queens don't tend to do well on Drag Race (at least the first time around) and Dragula tends to favor darker, sexier contestants over sillier spins on the same themes. Here, the queens are being judged on the execution of their vision of drag. One contestant literally only wears pink, while another pads in a sizable lower gut into all of their costumes. A larger contestants who wears very revealing outfits is critiqued not for choosing to dress that way, but for the fit of the costumes they did bring. The judges are trying to bring out the best in the contestants, not drag them down for being different. Camp Wannakiki is just delightful to watch. Camp Wannakiki puts up new episodes every Tuesday on their YouTube channel. Like what you're reading. Consider supporting Sketchy Details today.